The reason why Hidden Node is a problem is that Wi-Fi devices rely on "hearing" one another (called the Physical Carrier Sense in the IEEE 802.11 Standard) as the primary method of avoiding interference. Therefore, if devices have the ability to interfere, but cannot "hear", then interference is likely to occur. 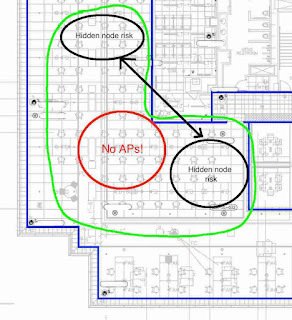 I have noticed that a lot of Wi-Fi installations seem to have been "designed" without taking Hidden Node problems into account. One of the most common locations where this particular "design" problem happens is when dealing with the corners of a building. The corner of a building can often be a trap, where Wi-Fi "designs" can get the corner and surrounding areas covered (with support for high densities of Wi-Fi devices, even), but leave those areas vulnerable to Hidden Node problems. The graphic above is from the "southwest" corner of an open office space. 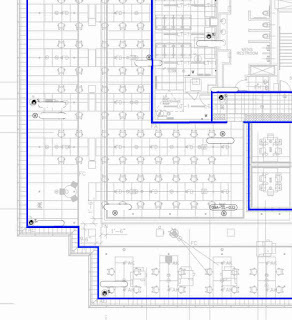 I've outlined the significant objects (walls, doors, heavy glass, et al.) with blue lines. 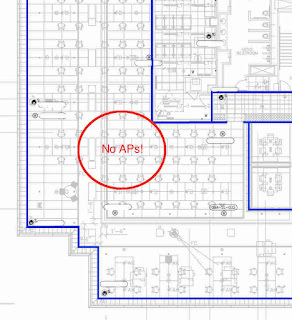 The key to avoid letting The Corner become The Trap is to avoid installing APs right near the "point" of the corner. 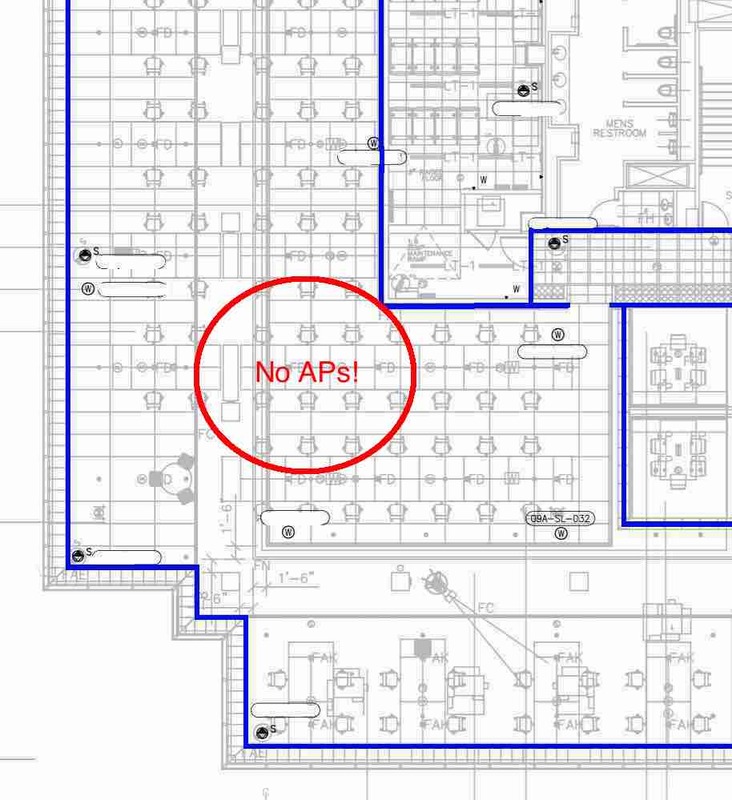 Notice that, in my "design", there are no encircled "W" markings (we used an encircled "W" on this project because the installers liked to refer to APs as "WAPs") in The Trap (the area labeled "No APs!"). 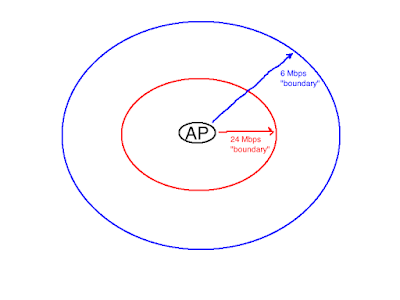 If I had an AP mounted in The Trap, there is an excellent possibility that it would have covered Wi-Fi devices to the "east" and to the "north" of the AP. 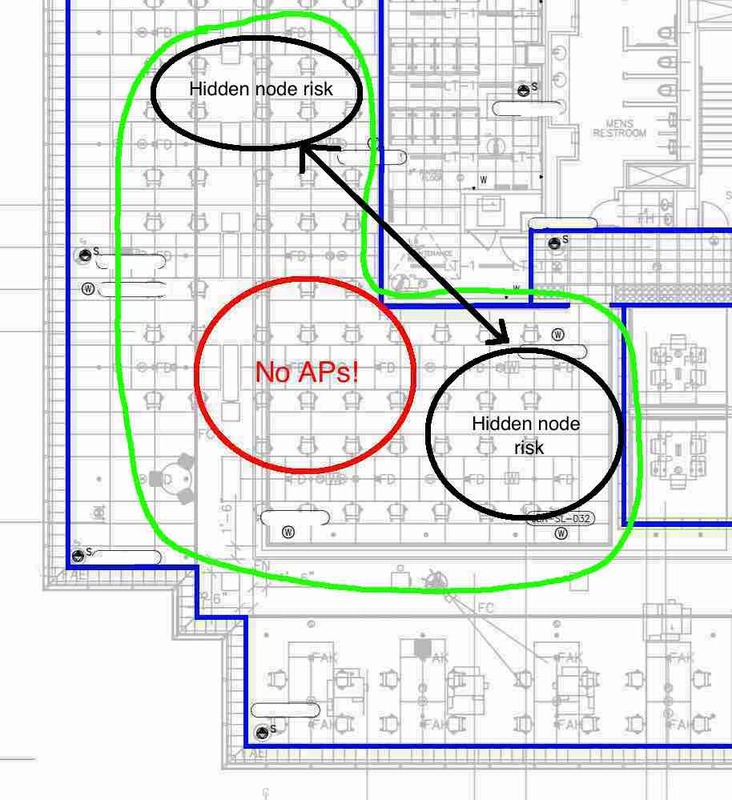 That would have increased the risk of the Hidden Node problem because devices in the two "Hidden node risk" areas could have been covered by the same AP ("can interfere"), but been blocked by the walls & objects of the IDF ("cannot 'hear'"). The bottom line for Wi-Fi folks embarking on a "design" is to take the advice that has been offered to at-risk inner city youth for many a year: Stay Out The Trap. Awesome post, Ben. 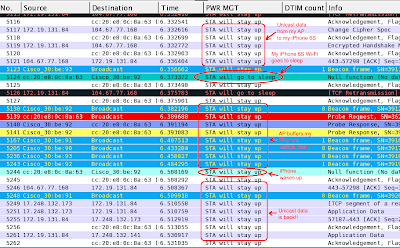 Again you show that Wi-Fi is not intuitive, but must be carefully thought out and planned using a strong knowledge base. And, I would like to steal your diagram for my classroom discussion about hidden nodes. Go for it. Thank you for the compliment. Hi Ben, how far apart are these APs? I've been going by the practice of 20'-30 between. And what power levels were used in this case? We allowed these APs to fluctuate between 14 and 17 dBm, despite my objections. I always advocate for static, uniform transmit power levels for AP radios. I think it was around 30 feet between APs and we went for around 60 feet between APs w/ 2.4 GHz radios enabled. The typical CWNA example in the textbook (which has remained over multiple iterations) does not do a good job of explaining the possible dangers of the hidden node problem. This does. Love it.